Property Size 2,440 sq. ft. Experience this home with it's authentic Native American decor. 5 Bedroom/3 Bathroom Home with Private Screened Pool, Hot Tub, Gated Resort Community, Two Master Suites, Two King Beds, Soaking Tub, Washer/Dryer, Fully Equipped Kitchen, Free Wireless Internet, Expanded Cable, Close to Disney. All our homes feature central air conditioning and are professionally cleaned and sanitized with fresh linens, towels, and blankets along with a full size washer/dryer. All homes are licensed by the State of Florida and equipped with smoke detectors, fire extinguishers, and pool safety alarms. We are long time members of the Better Business Bureau, Central Florida Vacation Rental Manager’s Association, Central Florida CVB, Kissimmee CVB, Orlando/Orange County CVB, and Visit Florida. The community is located just a minute or two from either a Publix full service grocery or super Wal-Mart and 24 Hour Pharmacy/Sundry shop. There are also many restaurants from fast food to fine dining, home improvement stores, mini-golf, Sam's Club, Costco, BJ's, and numerous other smaller attractions very close by. A Disney Exit is only 3.6 miles away. Sea World, Universal, and the Convention Center are approx. 15 minutes beyond that. Four major waterparks and hundreds of minor attractions are all within a short drive of your home. The Atlantic Coast Beaches, like Cocoa Beach or Daytona Beach are only about an hour to the east. The Gulf Coast Beaches around Tampa/St. Petersburg are only about an hour to the west. 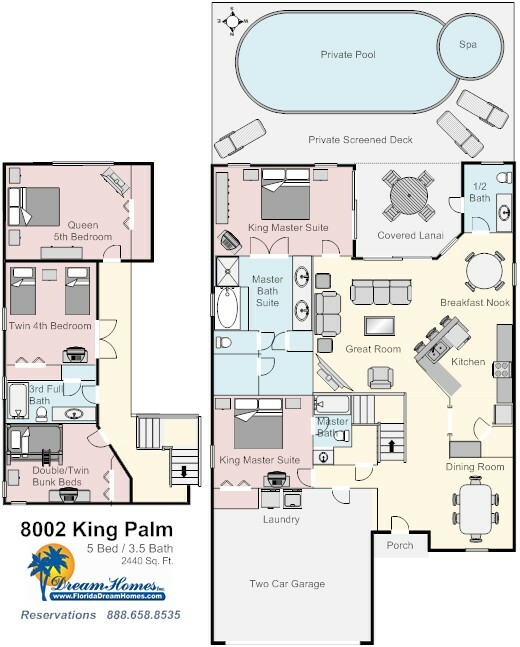 Olympic Size Pool, Spa, Kiddie Pool, Game Room, Nintendo Wii Room, Pool Tables, Ping Pong Tables, Weight Room, Sundry Shop, Picture Kiosk, ATM, Conference Room, Wireless Internet, Movie Theatre that plays Movies all day, Shuttle Service to area attractions (for a fee). To secure a booking, if your arrival is more than 60 days away, only a 20% non-refundable down payment is required. This down payment is part of your total balance and not an additional fee. If you are arriving within 60 days, the full, non-refundable balance is due. there is also a reservation fee applied to every reservation. The remaining final payment will be automatically charged to your credit card 60 days prior to arrival unless an alternative form of payment is made in advance. Our passion is to help you have the best vacation ever. We look forward to serving you! Boa opo para alguns dias com uma famlia grande na regio da Disney "Good option for a few days with a large family in the Disney area"
We are recommending this house to friends that will coming to Florida in August. Overall the home was nice. Our family enjoyed the pool and the location was very convenient. Having TVs in every bedroom was nice and the inside of the home was very clean. The area around the pool needed some attention. Lots of cobwebs and there were some things in the bottom of the pool from a previous family so it appeared the pool area had not been cleaned for awhile. The beds were not very comfortable and the living room furniture was not very comfortable but overall it was nice to have a home to come back to at the end of a busy day. This is our 3RD time staying with dream homes. Would do a fourth. 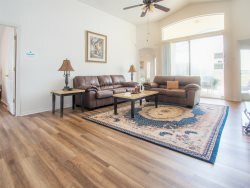 Nice place, very close to Disney and parks. Pool was great and very clean. Everything we needed was there to use. Overall very clean! Mattresses could have been in better shape and rug needed to be cleaned.